One of the reasons motorcycles are so dangerous is that they have a very low profile and are difficult to see on the road during inclement weather or while driving at night. These factors also impact the ability of drivers to accurately measure the speed of the motorcycle as it approaches an intersection or changes lanes. Whenever sharing the road with a motorcyclist, a driver should always err on the side of caution simply to compensate for these risks and factors, as providing more space and time to motorcyclists can ultimately be the difference between a nonevent and tragic accident. If you have ever watched a train approaching a railroad crossing, or an airplane taking off from a runway, you already have an idea of how the size of an object can affect your perception of its speed. Trains are notorious for moving much faster than people suspect they are due to their size, profile and the angle at which people view them. Motorcycles can play similar tricks on the mind— especially at night when they are only visible by their headlights and reflectors. Depth perception also plays a large part in the ability of drivers to properly gauge the speed of moving objects. Left turners are notorious for causing accidents because their depth perception may be off and this impacts their timing when attempting to navigate the intersection safely. The decision to simply let an oncoming motorcycle pass before making the turn could avoid an accident altogether, but many drivers feel like they have an enormous amount of space because the motorcycle takes up less space in its lane than a car normally does, giving the appearance that it is farther away. Intersections play host to numerous fatal motorcycle accidents, but drivers may misjudge their speed on the open road as well. For the same reasons that left-turners believe that they have more space than they actually do to make a turn, motorists may believe that they have the space required to make a lane change and inadvertently clip a motorcyclist when trying to pass or change lanes. This can occur when the car makes the initial move into the next lane or when attempting to get back to the lane the motorcyclist is occupying. Some of the most common risks to motorcyclists due to visual perception include the following. The location of a motorcycle at an intersection when making right handed turns. Right turners may turn into the path of a motorcyclist either because they believe they have more space than they do— just as left turners are prone to believe. Passing a vehicle on a two lane road with a motorcycle coming in the other direction. If a motorist decides to pass a vehicle while misjudging the distance between his or her vehicle and an oncoming motorcycle, the result can be a devastating head-on collision. Moving back into a lane too early. Determining a motorcycle’s position and distance through the side and rear view mirror or while in one’s blind spot can be even more difficult than when judging its speed at an intersection. Misjudging how quickly the motorcyclist is braking. Many motorcyclists are hit from behind when the following motorist follows too closely or doesn’t brake as quickly. Failure of truck drivers to track the motorcyclist. It is difficult enough for truck drivers to track other vehicles on the road without the added challenge of identifying a motorcyclist. The motorcycle’s low profile can make it virtually invisible to truck drivers at night. It is the responsibility of motorists to give plenty of space to motorcyclists and treat them as any other motorist on the road. 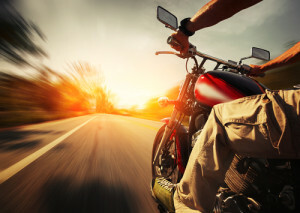 Even though many drivers collide with motorcyclists inadvertently, their failure to err on the side of caution makes them liable as long as the cyclist was not operating his or her bike in an unsafe or illegal manner. Even if the motorcyclist was wrong, comparative negligence laws may allow him or her to recover an amount of compensation proportional to the amount of fault carried by the other driver. The best time to seek legal guidance following a motorcycle accident is immediately after receiving emergency medical care so that your attorney has the opportunity to collect as much evidence from the scene of the accident as possible before it can be tampered with. Once the events leading to the collision can be reconstructed, your attorney can determine whether the other motorist failed to properly gauge your speed and provide you with ample space on the road. If you have any questions about your rights or your legal options, you can contact us for more information or to arrange a consultation.